Grout around a single tile is placed in about 30 seconds. A newly grouted shower cubicle takes about 1 hour. Placing touch up grouting (with a grout pen) needs about 30 minutes. Complete removal of old grout from a shower cubicle is between 4 and 8 hours. The specialist that will handle your grouting has done it hundreds, if not thousands of times before. Be it for your bathroom, kitchen, or any other room at your place, the task will be handled efficiently, with minimal disturbance to your routines, and no mess will be left behind. 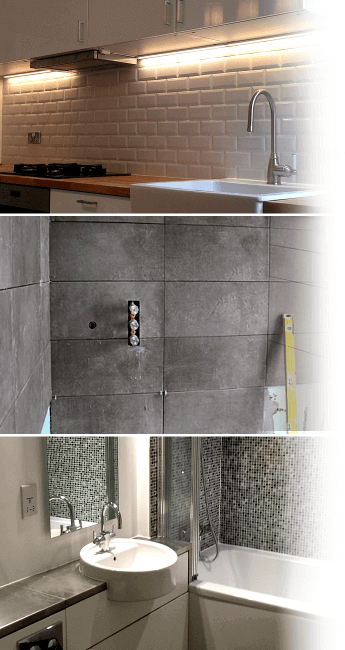 You can also rely on Fantastic Handyman to handle the tiling and sealing jobs. In other words, this service takes care of everything. Also, there are many colours of grout you can choose from so just tell us the one you prefer and we'll bring it. Keep in mind that the costs for the materials used will be calculated and added to the final quote you get for the service. This service is available for properties in London within the M25 in London & Manchester area.